From left, Kathleen Ewing; Julie Ewing '14; Craig Ewing '71, MBA '72; Kristen Ewing '14; and Alison Ewing '10 at the 2011 Red Hot Hockey Game at Madison Square Garden in Manhattan. Photo: University Photography file photo. In the 1870s, when freshmen often arrived to campus alone, on foot or by rail, and Cornell's tuition was $75 per year, faraway parents might count themselves lucky to receive a handwritten letter from their Cornellian once in a blue moon. From the university itself, they might receive nothing at all. 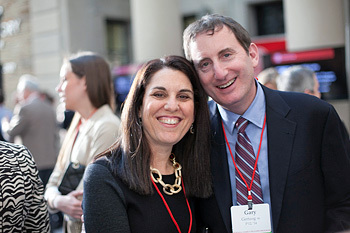 Lori '81 and Gary '80 Gertzog during the 2013 Cornell Family Fellows Campus Visit. They are the parents of Allison Rae Gertzog '12 and Bryan Gertzog '14. Photo: University Photography file photo. Today, parents of Cornell's 14,196 undergraduate students can text, email or call their children any time. They receive a monthly newsletter for parents, weekly and monthly Cornell email digests, and magazines and emails from their student's college, too. The parents' newsletter is a streamlined digest of student resources and important dates (course add/drop deadlines, the housing lottery start) for the parent who wants to know what's going on and how to lend a hand. "If my daughter's first day on campus is any indication, this university has come a long, long way from when I was a student," he said. "I asked my parents what they remembered of my drop off. They told me we left at five in the morning from Oradell, N.J., pulled into a parking lot on campus, and unloaded my luggage and together with one random but very helpful freshman, we carried my stuff up to my room." His parents left a few minutes later. One of the more than 400 volunteers lends a hand on Move-in Day at Cornell, which helps, welcomes, and informs parents as well as students. Photo: University Photography file photo. Today's move-in day features a well-coordinated army of volunteers -- including the president -- and numerous family-friendly events. Parents no longer drop off their students as quickly as possible. They linger. They soak in the atmosphere. They hear from administrators and faculty members. Vice President for Student and Academic Services Susan H. Murphy's (Class of 1973) Q&A, "Parenting 101," has moved from a small conference room on North Campus to Bailey Hall, the largest auditorium on campus. There is also a rise in parents' philanthropic support for Cornell. In Fiscal Year (FY) 2005, non-alumni parents of Cornell students made gifts to the parents' annual fund totaling $198,400. By 2007, that annual figure had risen to $945,000, and in FY 2013 non-alumni parents gave $1.76 million, representing nearly a tenfold growth in parental giving to the Cornell Annual Fund (CAF) in eight years. The university's goal for CAF gifts from parents this year is $3.7 million because for the first time, gifts from alumni with current students also will be counted in the total. "Several years ago," remembers Elizabeth Webster, director of the Cornell Parents Fund since 2004, "we didn't have much for parents to do. But now parents can partner as volunteers, help welcome new families, serve on committees and attend Cornell events around the world. Today there several parents who serve on the board of trustees." "The 105 Things Every Parent of a Cornellian Should Do" (pdf), a lighthearted list compiled in the early 2000s by the Office of New Student Programs, includes: "Attend a lecture by a world-renowned Cornell faculty member and understand why your student loves attending Cornell." Sharing their children's love for Cornell is a big motivator in giving, says Webster. "I think our children brought us in," says Shira Feuerstein (who with her husband, Robert, co-chairs the Parents Fund Committee), "because they were so excited about Cornell. And so we got involved." The Feuersteins are parents of a Class of 2013 daughter and a Class of 2017 son. The committee they head is a group of 160 parent volunteers who raise funds and volunteer for the Cornell Parents Annual Fund (unrestricted gifts). Their fundraising, directed by Webster, includes soliciting gifts, mostly by phone, from more than 500 families. Feuerstein appreciates that many parents' gifts support the Cornell Annual Fund for Student and Academic Services, which oversees student health services; the Carol Tatkon Center for first-year student programming and support; Career Services; and other programs that improve students' experience on and off campus. Charlie Phlegar, vice president for alumni affairs and development since 2006 and a Cornell parent since 2010 (his daughter Casey will graduate next year), says there is a sense of joy in parental philanthropy these days: "What I've found almost to a person is that the child is having a very, very positive experience, thus the parents are happy to be involved." He also notes that being a parent gives one an insider's perspective on "what's working well and what could be improved." Mostly, Phlegar says, being a parent of a Cornellian "shows you the true value of a Cornell education." Parents have been so generous to Cornell that a new recognition program has been developed for parents who give $10,000 or more in a year -- the Cornell Family Fellows. 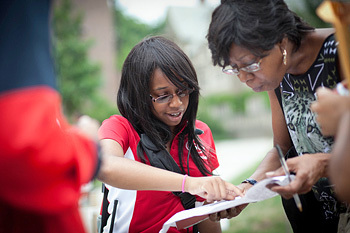 The program hosts events for parents on campus and across the country, showcasing the impact of parents' gifts to university priorities (such as faculty renewal, student and academic services, and facilities), fostering family philanthropy, and allowing new connections between families who support Cornell. "The format of the gathering was leisurely enough," Roby says, "that we had an opportunity to create a genuine dialogue, to hear about how the work we do fits in with their educational priorities; we don't very often get the chance for that kind of collaboration with the larger community we serve." "There's an energy with all the parents in the room," Webster says. "The majority are giving because of the outstanding experience their student is having at Cornell. They become our biggest evangelists." 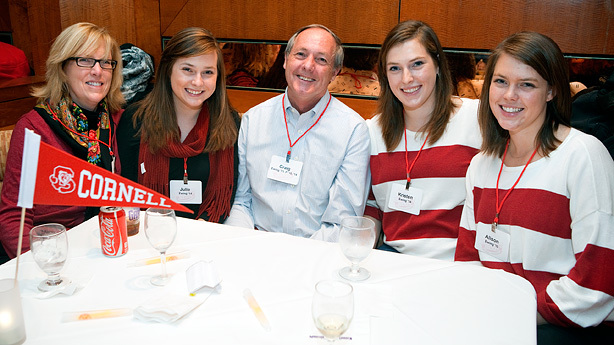 Cornell Chronicle Perspectives piece by Robert Glick (October 2013): "A Parent's Pride"